Alan Neaves – farm worker, coalman and, briefly, factory hand – is only fifty one, yet his working life has spanned a period in which profound changes have taken place in every aspect of rural life. Farmers have sold up, shops have closed and Orwell, like many other villages, is a silent place on weekdays. Alan recalls the 1950s and 60s when walking home from work was a slow progress from one neighbour to another as they stopped in the street to pass the time of day. He accepts the changes as the inevitable result of “progress”, but nevertheless regrets them. Alan was born at 26 Lotfield Street and by the age of ten was spending his out of school hours helping out at West Farm where he went to work full time on leaving school at fifteen. At that time farmer Alf Arnold practiced a mixed farming and, although tractors provided most of the motive power on the farm, horses were still being used for such jobs as carting water to stock out in the fields, rolling spring corn and hoeing the bean fields. Working hours were long, with a 7.00am start, even on Saturdays, and only one weekend off in three. With little of the mechanisation employed in farming today the work was physically hard. Endless rows of potatoes had to hoed by hand and sheaves of corn had to be set up in shocks to dry out before threshing. Nevertheless Alan looked forward to each day’s work. In his own words “Hard work and discomfort breed humour; it has to be so or we wouldn’t survive when the going gets tough”. He remembers with pleasure many a good laugh he had swapping stories with the men who brought the Flacks’ threshing drum round in the winter. He remembers too the stories of older men who had learned their horsemanship when all implements and conveyances were horse-drawn and who, of necessity, used methods unimaginably harsh to drive and discipline their animals. However, by 1963 the last horses had gone from West farm, the Arnolds no longer bred cattle and West Farm was a purely arable holding. With the death of Albert Arnold, who used to thatch the corn stacks, the last stack was threshed out in the “combines” moved in at harvest time. 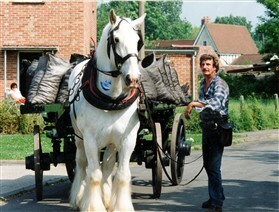 Alan missed the livestock and the variety of jobs associated with mixed farming. He went into partnership with one of his brothers in a coal business at Ashwell, but continued part-time for a while at West farm. He also worked for twelve “soul destroying” weeks at the Atlas Cement Company, Whaddon, where the indoor environment and the stop-go pattern of working to a bonus scheme nearly drove him mad. Twelve months spent working for Dougie Presland at the Wimpole woodyard were far happier. In 1966 Bruce Miller, who traded as a coal merchant at 85 High Street, became ill and Alan was asked to run the business, eventually taking it over completely in 1967. In the same year he married Linda Wilkins, who was also Orwell born and bred, and they set up home in Meadowcroft Way. In 1972 they bought the site of their present house and moved the coalyard to adjacent land. Their son, Martin, has joined his father in the coal business, while Samantha is busy in the personnel office of a Cambridge law form and younger daughter Anna is training to be a legal secretary. Many small coalmen have sold out to the bigger companies, such as Charringtons, but Alan’s customers appreciate his personal service and knowledge of his trade and business is thriving. Alan calculates that he has filled and humped at least 800 thousand bags of fuel in the past twenty eight years; no wonder his back went on strike for a while last year! The Neaves coal lorry delivers as far south as Buntingford and as far north as Swavesey and Willingham, but twenty-one year old Captain and his cart, once a familiar sight around Orwell, have recently been retired. 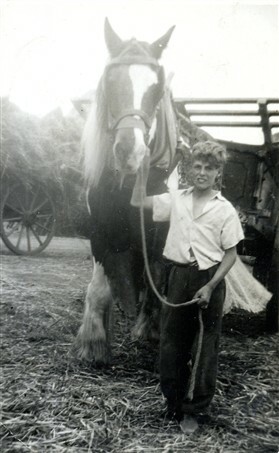 Captain’s work experience was not confined to coal deliveries; he also drew a plough to prepare the ground where his winter feed of mangolds was grown and occasionally – beautifully groomed and wearing his best harness – would deliver wedding parties to church. Training Captain to be a reliable workhorse was a pleasurable achievement for Alan, combining business with his love of working with animals. When he himself retires he may look for a pair of young horses to train with ploughing matches in mind. Shows have never interested him. Ploughing a perfect furrow or hoeing a straight row, as his old boss Alf Arnold could do, are the skills he respects and understands – not with the popular, rose-tinted view of the rural past but as a realist. Alan has been there and knows how it was. This page was added by Pat Grigor on 01/01/2013.